A public art piece in Ohio entitled Garden of Constants made me curious about Barbara Grygutis' other works. So far, I have visited two pieces in Texas, Leon Creek Crossing in San Antonio and Silver Lining in El Paso. 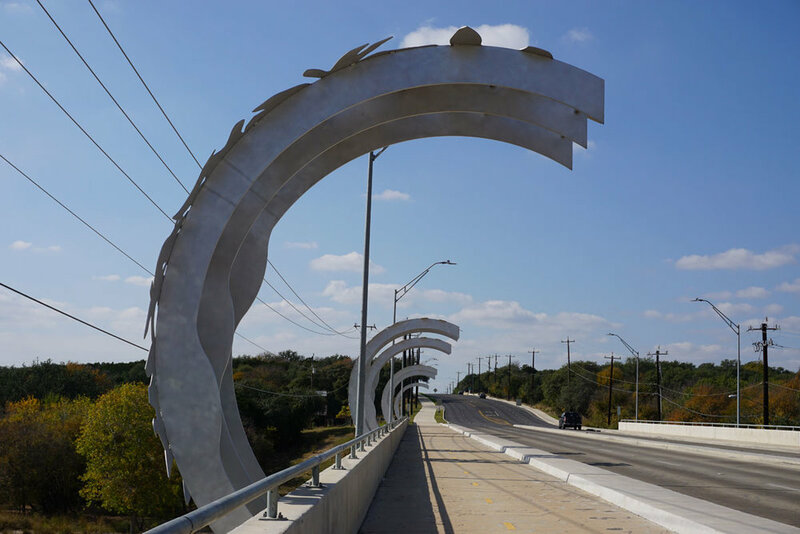 Leon Creek Crossing created in 2016, is a layered, multi-dimensional work of art designed for the Hausman Road Bridge at Leon Creek Greenway in San Antonio, Texas. The artwork brings images from the natural shapes of the riparian plant community up from below to create an inviting pedestrian walkway along the otherwise concrete bridge. The canopy of the passage echoes the tree canopy along the Leon Creek Greenway below. We drove to El Paso, Texas to see Barbara's Silver Lining. Fourteen identical sculptures created in 2009, emanate computer-synchronized kinetic light. 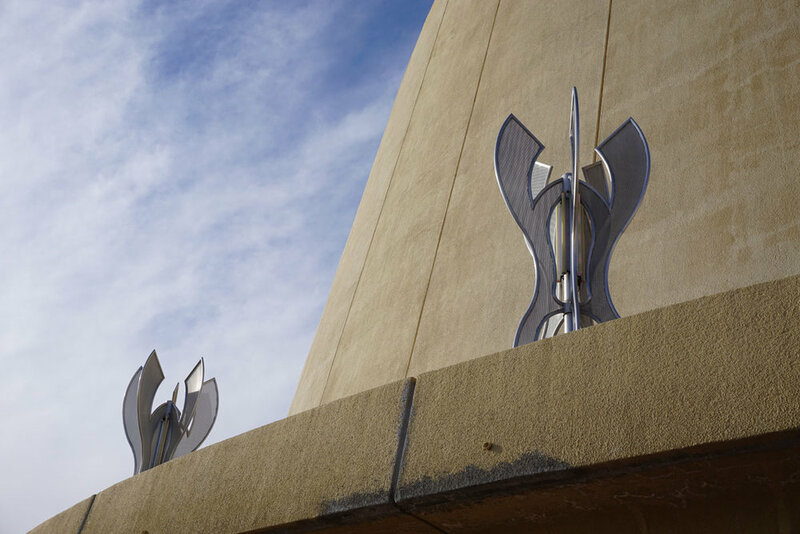 They are sited on the second story of the El Paso Civic Center to create an elevated pedestrian promenade, which circles the civic center. The circa 1964 building becomes the canvas for a shifting display of brilliant colored light. One can no longer walk through the sculptures as the second floor is barricaded. I shot my photos from the barricade and the stairs. It is unfortunate that the city has permitted this building to fall into disrepair. Barbara's sculptures still look good! While traveling through Tucson, last December, I had a chance to view Front Row Center built in 1999, at the University of Arizona. Front Row Center, the environmental sculpture consists of ten bronze chairs and five small amphitheater units used during outside performances and gatherings. 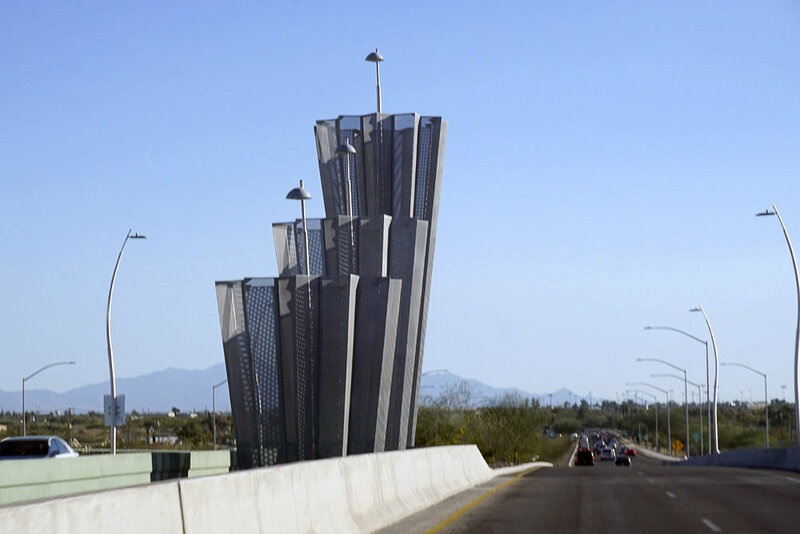 We are back in Tucson, Arizona, and serendipitously to my surprise while driving on Kino Parkway I saw Sonoran Passage a sculptural treatment of the major interchange bridge connecting Kino Parkway over 22nd Street. 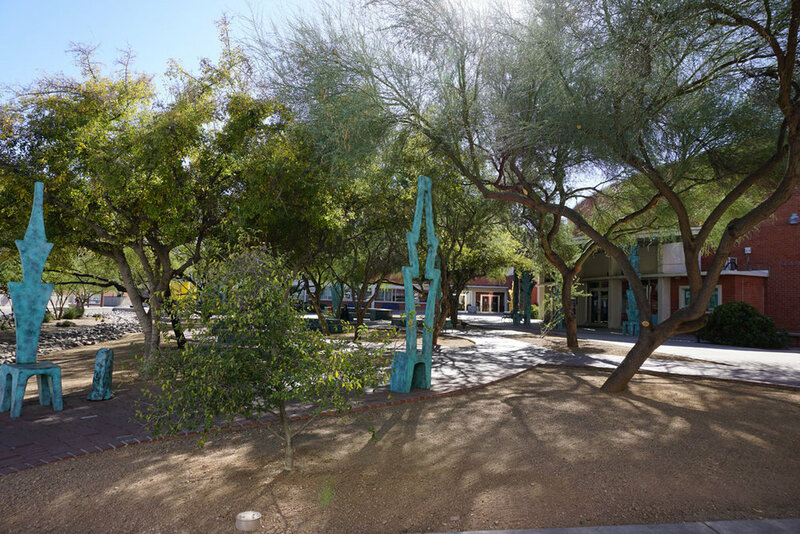 This gateway constructed in 2015 is the entry point to downtown Tucson and the University of Arizona from the airport. It includes 14 large sculptural elements integrated into the overall layout of the bridge. The bridge piers echo the sculpture forms’ design. The inspiration for this cohesive artwork was the cross-section of the Saguaro cactus, uniquely native to the Sonoran desert setting. Pedestrian rail arches additionally pull together all of the sculptural elements of the bridge. The sculptures are lighted at dusk creating a safe and welcoming atmosphere for commuters around the clock. Barbara’s sculptural environments enhance our surroundings and reveal unspoken relationships between nature and humanity. She engages the public through her works of art by identifying themes meaningful to each specific site and community. With over 75 large-scale commissioned works of public art throughout North America, Barbara is recognized internationally for her sculptural environments. When you look at a city from a different and new perspective, one can find the most extraordinary phenomenon for the mind and eyes. 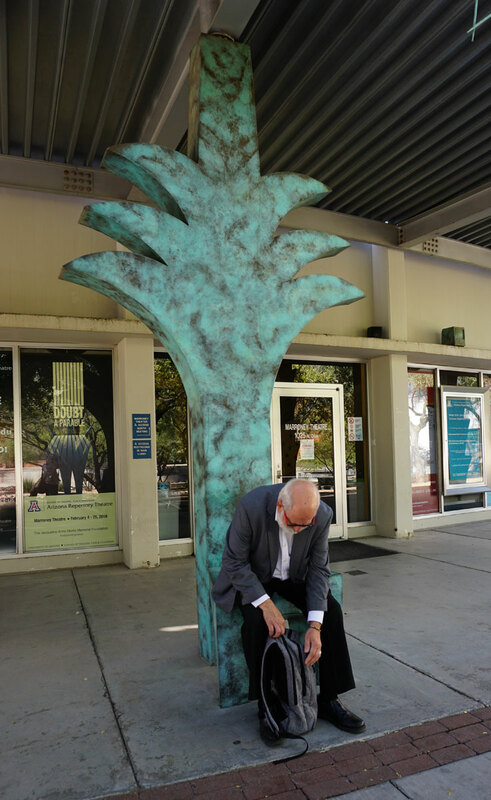 Looking forward to visiting other cities that have commissioned Barbara’s work.